A beautiful mix of clean lines with classic details, the Cara dining collection brings a transitional feel to your casual dining area. 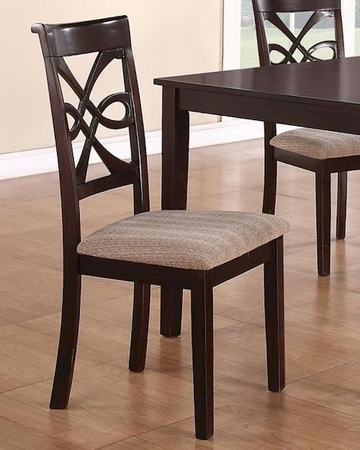 Constructed of select hardwoods and birch veneers in a dark cherry finish, the rectangular table pairs well with the elegant design of the side chairs with a decorative back rest. Just the right look for an elegant smaller dining area or eat-in kitchen, you are sure to enjoy the function and style of these pieces. With a curved open design, tall back, and the finishing curved top rail, this chair adds inviting style to your home. The dining chair's cushioned seat is covered in a soft brown fabric. Comfortable, durable, and stylish, this side chair constructed of select hardwoods and birch veneers in a dark cherry finish makes the most of your dining area.